If you're coming into some serious cash within the next two months, great for you! Much like winning the Lotto, it can be a huge rush. If you don't have a plan of how you're going to use the windfall, you will be tempted to spend on things you wish you had before, but could never afford. Like that awesome custom barbecue island! Or that gorgeous Mercedes! So prior to the money wire making it to your bank account, you must sit down and create a list of Must Do, and Can Wait. Your Must Do list needs to include (in this order) paying down debt, building your emergency reserves, and funding more of your retirement. These are truly Must Do's. Everything else, in theory, Can Wait. Even if you should need a new fridge because your old one isn't cooling as well, for example, you can always keep it a little longer or wait to buy a new one at a Holiday sale. But what if you had no debt to worry about, had plenty of cash savings, and didn't have a pressing need to buy anything new? This is the exact scenario a teacher colleague of mine is facing. He recently divorced and his ex-wife decided to keep the house she owned (on paper), but as a result of a settlement, needed to make my colleague an equity payment of $40K. There are no taxes to pay in this exchange so the $40K is free and clear. He knows I'm somewhat of a financial guru, but waited until almost meeting with a Mission Federal Credit Union rep to let me know how he intended to proceed with his windfall. The rep had made some commission generating recommendations, obviously! Like wanting my friend to buy a mutual fund from Jackson National. He had no idea that this represented active management, number one. Number two, it came with a plus 1% expense ratio. When he shared this information with me, I had to metaphorically slap him! After I educated him on active management versus what he could do on his own, we talked about his options. 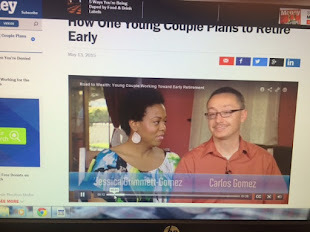 He already has a variable rate 403(b), meaning his holdings are tied to the stock market. He also has a Roth IRA, and he's on pace to fully fund 2017. You must compare apples to apples when sizing up mutual funds. 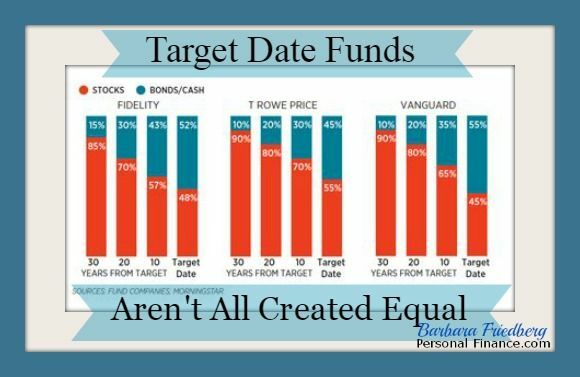 A target date fund needs to be compared with other target date funds, not with full stock funds. I didn't have the Jackson National fund prospectus or Portfolio Composition, but I explained that if this fund is composed of higher beta and/or growth stocks, it would explain the funds performance being so high. After all, we've been in a bull market for years! The bull market became the next topic of discussion. 1) $10K into a low-expense target date fund. Why such an emphasis on savings? Well, the CD ladder above will allow my friend to buy into the market, if he should choose to, in 6 month increments. (He can always continue the ladder by buying another 24-month CD). The market is at an all-time high right now. In 6 to 12 months, there will be more clarity. And, with the Fed raising rates, it may be time to seriously consider adding short-term (maturity) government bonds, CD's, and MMAs to your portfolio. The only thing I caution is for you to stay alert on the rate of inflation. Right now as reported it is 2.1%. As you can see from above, the only CD rate above this is the 24-month one. But what my friend needs right now is staggered liquidity because his ultimate goal is to enter the stock market. If rates rise and inflation stays at 2.1%, he'll have a better chance of earning better returns on the CDs. Now, I'm not the only one guiding people back into saving vehicles that offer muted returns. This weekend's Barron magazine also did the same in an article titled, Last Rites for the Bond Rally, touting the benefits of buying short-term government bonds at auction via the website, treasurydirect.gov. Whatever windfall amount is coming your way, deciding what to do with it will consume a ton of mental energy. Don't sit on the cash, of course, placing it into a regular bank savings account. But don't also go on a buying spree. To my friend, $40K may as well be a fortune. And in some respects, it is! He needs to make the best possible decision and the only way to do that is knowing all there is to know. No doubt the knowledge I have given him will lead to more initial indecision, but in the end he'll have made more sound moves with his money.